Munchkins, meet your greatest challenge yet... the evil minions of Cthulhu! Will you survive? Will you retain your sanity? Will you ...Level up? 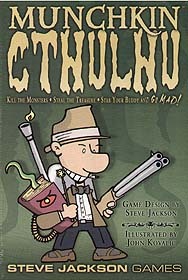 In Munchkin Cthulhu, you can become a Monster Whacker, an Investigator, a Professor, or a Cultists. But once you're in the Cult, it's not easy to get out! You'll study the Necrognomicon and the Innsmouth Yellow Pages in order to defeat classic monsters from outside reality, like the Froggoth, the Unpronounceable Evil, the Shallow Ones, and the mind-destroying cuteness of Chibithulhu. And they all have Stuff you can take from their twitching bodies. Even if you go mad in the process. Madness doesn't matter. WINNING matters!